The Rabbinical Congress for Peace has sent a letter to Prime Minister Binyamin Netanyahu and to each minister in his government urging them to cancel their decision to release terrorists as a “gesture” to the Palestinian Authority (PA). “Out of all the deplorable and dangerous moves that governments in Israel carried out in the past to start a so called 'peace process' the current move is the most dangerous of them,” the RCP wrote. “Today there is absolutely no expert or pundit who thinks that [PA head Mahmoud Abbas] is serious about peace with Israel, they know he has no control over the Arab street. 'In a final resolution, in the new Palestinian state we would not see the presence of a single Israeli,' he told Egyptian journalists last week. Does he sound like a man seeking peace with Israel? “It should be clear,” the RCP wrote, “that the Palestinian Authority has no intention of making peace. It only wants to get concessions and blame Israel for an absence of peace. It knows that the Obama Administration will never punish it if it balks but probably will only offer it more. The negotiations will, as in the past, only make matters worse and in the end the world will blame Israel. “Worst of all is that this time the Israeli government is stepping into the trap with open eyes, it knows too well the price we are going to pay, G-d forbid, for this adventure. It even adopted a decision that will help the new terror wave by providing 'backup' in the form of dozens of the most dangerous terrorists, savage murderers of men women and children. “Is there no limit to madness?! In their letter the rabbis add: “We unequivocally affirm that according to Jewish Law, if you cannot withstand the political pressure each one of you is morally obligated to resign immediately. Releasing even one terrorist endangers Jewish lives. A recent research found that 75% of the terrorists that have been released in the past revert to attack Jews. This also encourages others to engage in terrorism confident that they will be released. “Thus it is better that the whole government resign than to release even one terrorist. 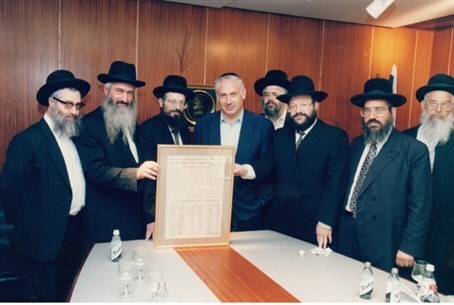 In a special message sent to the ministers of Bayit Yehudi, the rabbis added: “According to Jewish Law, it is forbidden for you to remain even one day in a government that releases cruel terrorists and is prepared to negotiate with its enemies and murderers on the borders of Israel. “You are not doing a favor to the Jewish nation by adding more apartments in Judea and Samaria because by remaining in a government that advances such dangerous policies you are stabbing the settlers in the back. Besides, there is no guarantee that you in fact will get these housing units following the international outcry against it.